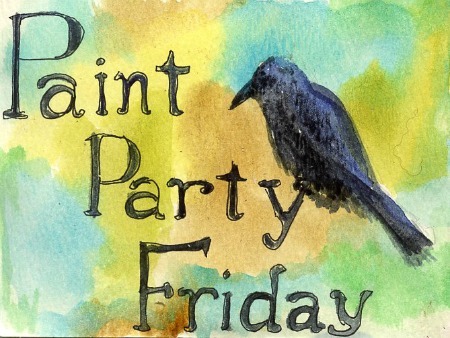 Thank you for featuring her and hosting Paint Party Friday! Your work is amazing Mimi. Watercolor isnt easy. Good to know its easier with better Brushes and Paper. Great interview. Happy PPF. Wow, Mimi is definitely tops in her work. Great job and congrats Mimi on the write-up in the NY Times and your retirement. Wish you all the luck in the world. Happy PPF everyone. Have a great weekend. Great learning more about you Mimi! Mimi, your work is wonderful. Amazing portraits! Mimi, you are amazing. I love your work. Your story is much like mine, only mine is with cloth dolls. I find that have the best notions/supplies help so much not only getting the task done, but the finished product is better. I too retired into it. Congrats. Blessings, Janet. Oh My Lucky number 13 this time ! Happy to meet you Mimi ! your watercolors are very nice. I also have a Fine art America page but I haven't sold much from it yet. Although I have ordered and am very happy with the quality of the prints through them. You ought to treat yourself to just one good brush and one full sheet of good paper. Spend $25.00 just for fun. Your portraits are amazing. Bravo on the recognition your Obama portrait got! It deserved it all. HAPPY PPF! Amazing work, and wonderful to get recognition for the Obama painting. Love that her painting of Obama was features in the New York Times! It needed to be, it's amazing. I admire anyone that can do portraits. Nice interview and beautiful paintings Mimi, been to your FB page and liked it. Happy PPF to all of you. THANKS! I saw your name and thought, hmmmm that's familiar!!! Incredible! Your work and story are both wonderful and inspiring. Wonderful spotlight on Mimi...and wow..such gorgeous paintings/portraits...fantastic work..shine on! Amazing Art Mimi! Looking forward to more of your masterpieces! Wonderful portraits! Congratulations on the success already accomplished and may you continue to win awards. wonderful to learn more about talented Mimi! Such lovely work. Had some good studio time this week - this fun froggy was one of my projects! 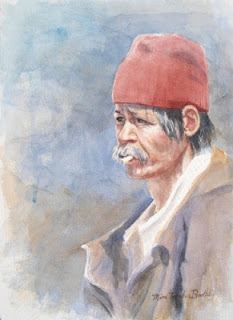 I so admire people who can paint fabulous portraits - these are lovely works! Wow!! Nice to meet you Mimi!! Your work is amazing!! Beautiful portraits! Amazing portraits! And wow, congratulations on being featured on the front page of the Sunday New York Times. Although it was a pretty heady feeling to walk into a restaurant one Sunday morning and see MY painting on the front page of the New York Times they were selling, It's also really important and uplifting to be featured here, among my peers. I consider this to be quite an honor and I thank you all for your kind words. wow - thanks for the great post about Mimi! 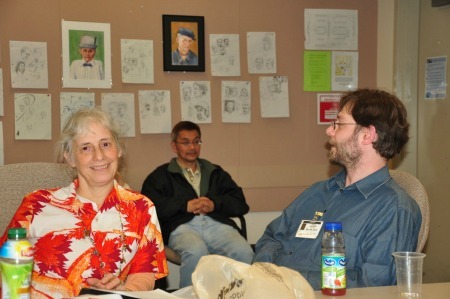 I have known Mimi's work from before I even knew to come to PPF and Sunday Sketches, etc, through another forum. I loved reading about her life, and Obama and all of it. Wow... excellent work! Keep it up and thanks for sharing it with us!!! What a wonderful insight. It's so true about the quality of the materials (unfortunately for our pockets!!). 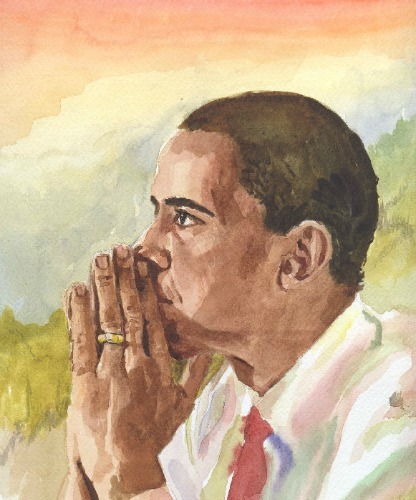 Great story about the Obama painting. Wow, I never knew that about you! I love, love, love Mimi's art work. She is truly inspirational. Blessings! Mimi is a great artist, I admire her from that I started to visit PPF, happy summer to all. Hi everyone. This is my first time joining the party, and I know I am going to have loadsa fun. Thanks for the interesting interview too. these are incredible--- so much raw emotion captured. I'm not surprised that your portrait of obama was so well received. how exciting to be featured in NY Times! I loved reading about your retirement party... what a fabulous idea-- and a great way for your co-workers to hold on to you even after retirement. I'm anxious to see more of your art now that you will have so much more time on your hands! enjoy your retirement! Wow, what an amazing artist. Mimi has done some wonderful pieces. Congratulations on the Sunday New York Times, that is quite an accomplishment. Gorgeous portraits! Painting people and dogs was how I started out--I loved the challenge of trying to capture quirks and personality. This kind of work takes so much discipline--great job, Mimi! There is such feeling in these portraits, beautiful work! So lovely! You can see how much she loves painting portraits. It shows in the faces of the subjects! Love the paintings!! . SO much life and detail in them. My day has been frustrating and to top it off I linked the wrong blog on my first attempt to join today :0( The second entry is the correct one. This is my first week of participating, and I am enjoying visiting everyone's blog to see their art.Have a fab week everyone, from a rainy rainy London. What a great retirement party you had, Mimi! Beautiful portrait work - congrats on retiring...now you'll have so much more time to create beauty to share! Beautiful inspiration and watercolors! It's hot and humid here in NJ -- nice to be inside where it's cool, visiting other blogs! My entry for this week - didn't get much painting done - but did do a watercolored pear (done with Twinks and Inktense pencils) for Artist's Play Room challenge.